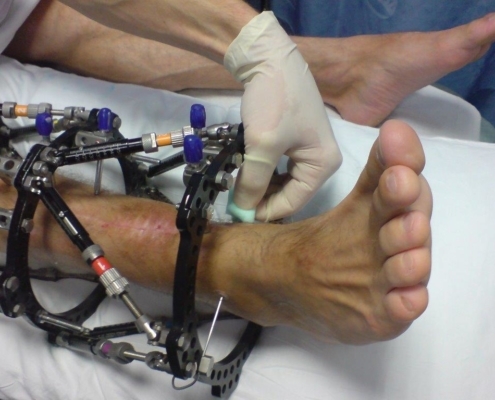 The patient walks on a dynamised frame to check that the bone is strong enough for the final removal of the frame. Once the rings are removed, the pin sites will bleed for a few hours. Dressings are applied, with instructions to remove after 48 hours. There has been much debate about the best way to look after pin sites and many scientific articles have been written on the subject. In reality, there is little evidence to say that one system is better than another. Some departments and surgeons say the pin sites should be covered daily and kept dry. There is also a debate as to whether the scabs should be removed. Other surgeons feel that clean, dry pin sites can be left open to the air. Most surgeons do agree that a daily shower helps. This includes dousing the frame liberally with water. But whether you should use suds or not remains a subject for debate.